We have a new tournament moderator: Azar.! 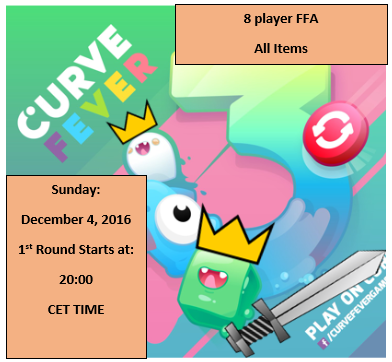 8 player FFA, all powerups, all Curves allowed! The schedule is going to be posted on the CF Discord Channel under the tournament section ​before the start of the tourney. We will be there to assist you before and during the tournament if you have any concerns. The organisation is always right. Moderators will make sure no duplicate rooms are created. If you have no opponent in the schedule, you will auto advance to the next round. How do we see the list of players? I've tried multiple times to sign up, but I'm still not on the list. I've filled in every question correctly. The list is not updated immediatley, just manual ~every 24h, but can also take longer. Just show some patience and wait a day. And if you are still not at the list, just write a message to Run. directly(before sign up is closed). Could you please update the tournament participants list? You were one of the players who forgot to write their name in the sign up questions, so that's why you're not included. Whats ur CF3 username? If we forgot you and you signed up answering ALL the questions ill add you, but if you didnt write your name when you answered the questions, its your own fault, since I've been telling people to remember to write their names as well the last 2 days, and then you wont be included. There was a guide over the list of players that signed up. ''How to sign up''. There was a link to click until 3rd of December 20:00 CET. :) Next time, read the whole sign up topic so you don't miss out ^^. Could u post schedule here, i cant rejoin to ds ? I am noob & I know it but I always fight to the end.